The first run of the XLR5 Velocity had a reach from the pistol grip to the trigger that was too long for some shooters. The pistol grip was quickly redesigned and after that, in 2014, the XLR5 was launched as part of the Syren line, Syren USA being a line of shotguns specifically designed and engineered for the female shooter. Whether you think the XLR5 is a “beast” or not, has a lot to do with the specific model you are referring to. What was initially just the XLR5 Velocity has changed, dramatically, for you now have the XLR5 Velocity AR (adjustable rib), the XLR5 Velocity LR (long rib), the XLR5 Velocity FR (flat rib), and the XLR5 Velocity FR Compact. There is nothing at all beastly about the XLR5 Velocity FR Compact, for example, as it is only about a 7-1/4 lb. gun with a 13-3/4 inch length of pull and a 28 inch barrel. Of the three dedicated Fabarm clays models I've gone through, the XLR5 Flat Rib is my favorite: http://randywakeman.com/Review2015FabarmXLR5VelocityFlatRibAutoloadingShotgun.htm . 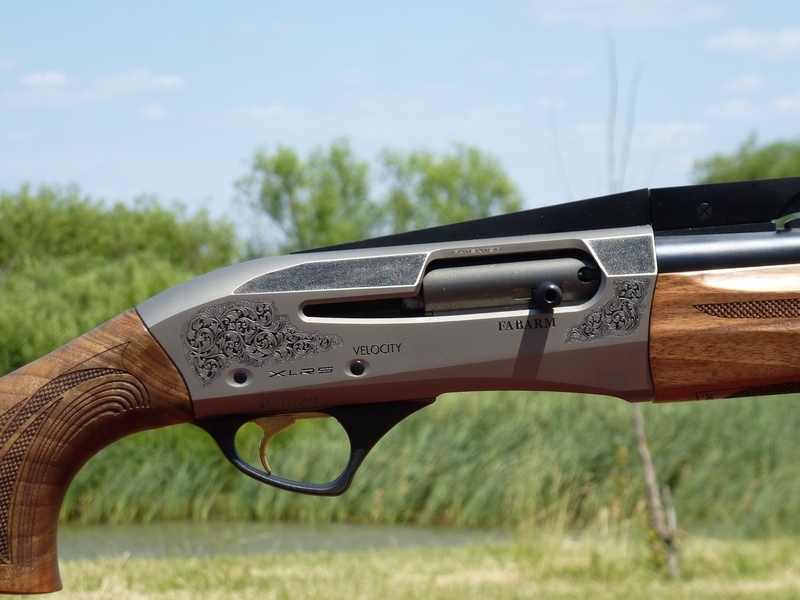 It is responsive yet smooth and stable clays gun, 7-3/4 lbs. out of the box, and fits me perfectly. If we all wore the same shirts, trousers, and boots then I suppose we'd have a better chance at all shooting the same configuration of shotgun. We don't, of course, which is why there has to be so many options. Cole Gunsmithing features the XLR5 as their premier clays autoloader, and Rich Cole is quite particular about shotguns. The “Pulse Piston” used in the Fabarm Autoloading Competition line is really the pulseless piston, for it does not have the elastomeric friction brake on it used in the XLR5 3 inch hunting guns and the new 3 inch chambered L4S. This was done to ensure 7/8 oz. target load reliability, for the 3 inch Fabarm shotguns handle 1 oz. 1200 fps loads on up. I'm mentioning all this due to all of the questions asking about the XLR5 and a lot has to do with what XLR5 is being referred to. In the XLR5 competition target line alone, there are already five distinct models, and that doesn't include the XLR5 hunting line, the XLR5 Waterfowler being released for 2016 and that is a 7-1/4 – 7-1/2 lb. camo hunting model. The L4S, introduced in 2015, is an aggressive redesign of the XLR5 platform, lightened to 6-3/4 pounds, still retaining the industry-leading proof levels of Fabarm Tri-Bore barrels that have no velocity loss from having a back-bored section, and are approved for steel shot in all choke constrictions which is another industry first. Like all of the Fabarm autoloaders, the L4S is available in a left-hand configuration as well. So, when someone asks “what do you think of Fabarm autos?” there is no easy, simplistic answer. It all depends on your intended uses and your personal preference as far as rib, adjustability, weight, and so forth. It is an increasingly broad line, although the L4S isn't strictly marketed as a clays gun, for many people it is as close to the “do it all” type autoloader as can be had. I hope that this brief overview helps eliminate some of the confusion, for I'm advised that sometimes I'm quite easily confused myself. To summarize: the XLR5 Velocity competition clays line is the AR, LR, FR versions along with the FR compact all have 2-3/4 inch chambers, target triggers, target bolt releases, and target bolt handles. The action is the same, with a stainless steel piston that does not have the elastomeric component of the 3 inch Fabarm Pulse Piston models.The XLR5 hunting line is new for 2016 in the U.S., starting with the XLR5 Waterfowler. It has a composite stock, done in camo, a 3 inch chamber, and the elastomeric Pulse Piston drive system. The new for 2015 L4S series has an aggressively streamlined action, 3 + 1 capacity, three inch chamber, has a Pulse Piston drive, and weighs in at 6-3/4 lbs.